NPR reported on a highly controversial theory to explain the amazing caterpillar-to-butterfly (or moth) transition. I’m not so sure about the theory, but current scientific knowledge about the transition has sure advanced from my grade school days! As described in the NPR report, different parts of the DNA inside each cell of a caterpillar or moth are activated at each phase of its life. 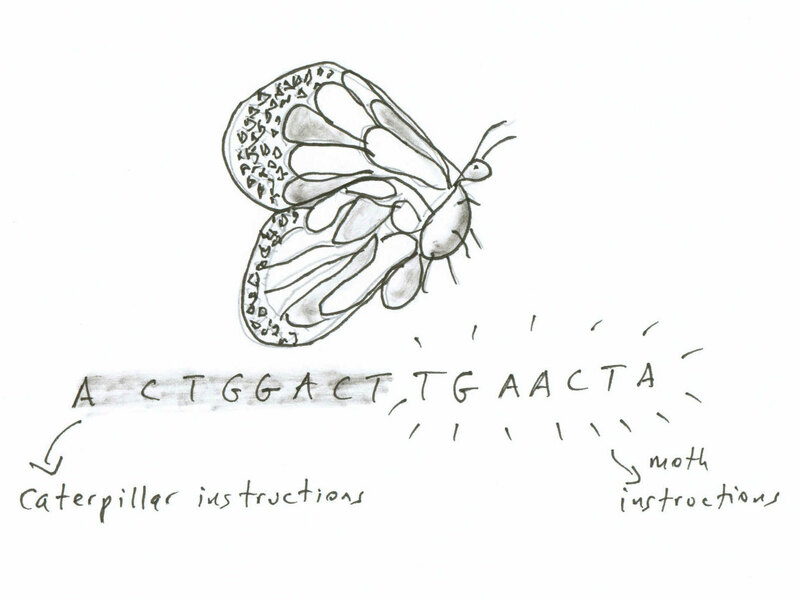 As a caterpillar, one part of the DNA takes in nourishment and uses it to build a caterpillar body. The transition – which we didn’t learn about in grade school in the 1950s – is amazing. After spinning a cocoon around itself, the caterpillar “shrinks, sheds its skin and its organs dissolve. Its insides turn to mush. Most cells die.” A few “imaginal” cells spring into action to reorganize the proteins and remains of the caterpillar into something entirely different – the moth or butterfly. Most of my life transformations have a similar messy, lifeless, and gooey condition in the middle of them – a situation that feels like death or generates tremendous avoidance (dissertation, anyone? or religious vocation?) This seems to be pretty common, from A.A.’s emphasis on “hitting bottom” to the periods of solitude in the lives of most saints. The butterfly, taken as metaphor, points to a reality that we hope for but cannot quite believe in: that the future self is ready to spring into being. That all of the necessary elements are present even in the midst of the gooey mess. That the design of the new was present even in the old. What about the “junk” in our DNA and our lives? In 1972, when human DNA was just being decoded, much of it – as much as 95% – was termed “junk” DNA. Wikipedia now terms them portions “for which no function has been identified” and describes various perspectives about this DNA. Most of us have lived through situations – often painful or difficult – that didn’t accomplish anything that we could see. Many seem just as useless today as they did at the time – but a few contained elements or patterns that provided a useful framework at some later date. Hard lessons I learned in teaching historical dance taught me patterns that have proved to be sure guides in a monastic life that I never dreamed of at the time. More than a pretty resurrection symbol, the butterfly – and the moth! – offer a different perspective on those dark, messy, gooey places in life. They may be the only route from who we are now to who we might become.